To see pictures of Class 25C-66R and Class 25A-66R go here. Thanks to Chief Rich for making them available. My name is Karl "Kris" Kristiansen and I was a CTR3 (Charlie Section), stationed at Bremerhaven, Germany from November 1966 - June 1969. I am looking for any information, pictures, documents, concerning B'haven or any personnel who served there. If you were a CT and would like to contribute to this page please Email me. Thanks. If you need a copy of your Military Records or want to check on any Military Awards and Medals you may qualify for, visit the National Archives and Records Administration. Here you will find information and the forms you need to process your request. If you are a military veteran or next of kin, you can now download your military records. Go here for details. ATTENTION NCVA-NE MEMBERS: Now accepting orders for NCVA-NE Apparel. Go here for details. Wetter Online - Click on Webcam link under Weather Information. Bremerhaven Coming Down - Nostalgic video of a former AFSS personnel stationed at Bremerhaven. Carsten Hessler - Bremerhaven blog. 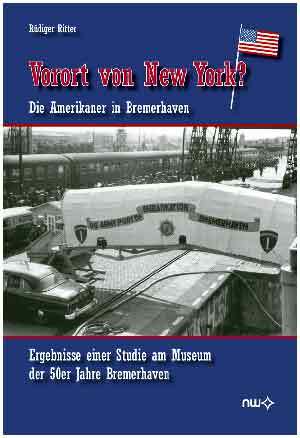 Additionally, we will organize an exhibition on Americans in Bremerhaven, which will take place in summer 2011. For this purpose, we are loooking for souvenirs, documents, photos or anything else remembering the German-American encounter in Bremerhaven. I would be glad if you can put this on your website, too. 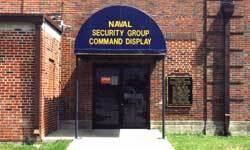 Take a virtual tour of the Naval Security Group Command Display located at Corry Station Pensacola, FL. Shipmates: I would like to collect information on Sleazy's for a special section on this infamous watering hole. Since it was such a part of many of our days in Bremerhaven, it deserves its own place on this website. If you have any pictures of Sleazy's would you please email me kman@meganet.net. If you have any stories (suitable for all audiences please) send them along. Thanks, Karl. I have downloaded and edited an HTML version of my OLD Deck Log. To view it please go here. Membership in the Association is open to all officer and enlisted, regular and reserve, active, inactive, or retired, of any U.S. Armed Service Personnel who served at USNTC Bainbridge, regardless of duration of said service. An Associate Membership is open to all civilians, spouses, and children, who served at USNTC Bainbridge, regardless of duration of service. The Goal is to save Bainbridge, in a sense. It has been demolished and to prevent it from passing into obscurity, we are hoping to establish a museum and Memorial Garden (National Cemetery)! If you know someone who would be interested, please forward this information to them. Thank you. Joe Glockner's Navy CT History page. Check out the 6913th RSM website for pictures and personnel rosters from the Bremerhaven AFSS detachment. Please visit the ASA Bremerhaven HFDF Detachment website. Want to brush up on your Morse code? I recommend MorseCat and best of all, it's FREE!. Their website has a dead link, but I will email [kman@meganet.net] the file to you. For more detailed information go here . The effective date of the change from Communications Technician to Cryptologic Technician was 26 March 1976. The reason for the change was to bring the enlisted rating of Communications Technician into consonance with the Warrant Officer (744X), Restricted Line (161X), and Limited Duty Officer (644X) which were already designated "Cryptologic Technician", "Special Duty Officer (Cryptology)", and "Limited Duty Officer (Cryptology)" respectively. Cryptologic technician ratings (CTT, CTA, CTM, CTO, CTR, CTI) work with some of the most sophisticated and complex systems the Navy has to offer in performance of their mission. All of the CT career fields offer impressive training pipelines, excellent promotion opportunities and diverse job assignments. CTTs operate Electronic Intelligence (ELINT) receiving, direction finding, recording, and related computer equipment; operate sophisticated state-of-the-art radar electronic equipment, magnetic or digital recording devices, analysis terminals and associated peripherals; perform a variety of duties associated with computer equipment, video display terminals, computer interface consoles, and non-morse communications systems; provide ELINT analysis and technical guidance to the fleet (air, surface, and subsurface) in support of national security requirements. CTAs are a focal point for carrying out diverse administrative, clerical, personnel and physical security duties for the Naval Security Group, intelligence communities (ashore and afloat); perform manpower analysis; maintain classified inventories, information management, and publications; operate AIS equipment in a technologically advanced workcenter environment; prepare and route correspondence and reports; serve as courier for the Defense Courier Service (DCS); and perform in a Full Time Support (FTS) capacity for NSG cryptologic reserve program at Naval Reserve Centers worldwide. CTMs are highly trained sailors that install, test, troubleshoot, and repair electronic systems used in data communications and signal collection both ashore and afloat. They inspect and inventory assigned equipment, order parts, and prepare reports. They employ software computer based system diagnostics as well as traditional electronic test equipment to isolate failures to the lowest replaceable unit. They repair and replace software from remote locations using Local and Wide Area Networks and satellite links. They are responsible for proper operation of commercial "off-the-shelf"systems as well as standard governmentequipment. The training they receive begins with basic electronics and over the course of a career will include sophisticated engineering concepts and resource management techniques, ship operations, safety and shipboard damage control. CTOs perform a wide variety of duties associated with operating telecommunications systems which exist across the global communications spectrum. Their advanced AIS networking and information management skills support the movement of data to operating forces ashore and afloat. Administrative duties include maintaining files and updating communications publications via automated methods. Technical duties involve the control and operation of communications systems and networks including satellite systems, network servers, modems, routers, and communications security devices. Quality control is performed using state-of-the-art test equipment such as oscilloscopes and LAN analyzers. CTRs perform a variety of duties worldwide at numerous overseas and stateside shore commands and to a limited degree aboard ships, aircraft, and submarines. Duties include performing collection and analysis of state of the art communication signals using sophisticated high powered computers, specialized computer-assisted communications equipment, video display terminals and electronic/magnetic recorders. CTRs learn about the newest innovations in communications and analyze those signals. In addition to these skills, the CTR rating has additional formal training in satellite communications, high frequency direction finding, direct support to ships and submarines, shipboard and aircraft cryptologic systems, special projects, and manual morse collection. CTIs are highly trained sailors serving within the Naval Security Group Command who provide crypto linguistic and analytical support to high level government officials and military commands in support of national and theater objectives. CTIs serve in a wide variety of duty stations, as well as on aircraft, ships, and submarines, and normally work with sophisticated computer data bases and electronic equipment. WASHINGTON -- In yet another force-shaping move, the Navy announced the establishment of the Cryptologic Technician Networks (CTN) rating in February. It is the first new rating of the 21st century. The new rating, which became effective Feb. 6, is designed to further develop a skilled work force to meet fleet requirements in computer network defense and other computer network operations. It also supports the Chief of Naval Operations' guidance to transform information operations. "This rating will be based on 21st century computer skills. It is just one more of many force-shaping initiatives the Navy is pursuing," said Cmdr. Mike Bryce, Cryptologic Technician community manager. "More importantly, this one will better give the Navy the ability to defend and exploit computer network systems." That mission area is currently being performed by the Cryptologic Technician (Communications), Cryptologic Technician (Maintenance) and Cryptologic Technician (Administration) ratings. "Creation of the CTN rating is a positive move toward consolidation of CT skills," said Chief of Naval Personnel, Vice Adm. Gerry Hoewing. "Establishment of a single rating is the most effective and efficient way to engage the types of information technology and computer network threats we face in this new century." Initial conversion to the CTN rating will be limited to personnel already designated as Cryptologic Technicians. Ultimately, all eligible Sailors will be able to apply for conversion. ACTIVITY (NSGA) TO NAVAL INFORMATION OPERATIONS ACTIVITY (NIOA). RESPONSIBILITIES THAT ARE SERVICE CRYPTOLOGIC ELEMENT SPECIFIC. CONCERT WITH NNWC UNTIL NSG IS COMPLETELY INTEGRATED INTO NNWC. NNWC UNTIL NSG IS COMPLETELY INTEGRATED INTO NNWC. BE FULLY INTEGRATED WITHIN NNWC. WILL CONTINUE AS KEY LEADERS IN THE NNWC MISSION AND ORGANIZATION. ESTABLISHED THE NSG COMMAND HEADQUARTERS UNDER A FLAG OFFICER. SECGRU CASUALTIES WHILE ON WATCH. 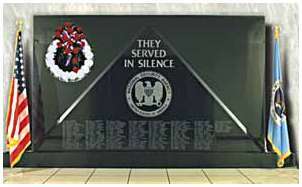 The National Security Agency/Central Security Service Cryptologic Memorial is intended to honor and remember those who have given their lives, "serving in silence," in the line of duty since World War II. The names listed include Army, Navy, Air Force, Marine and civilian cryptologists who have made the ultimate sacrifice in hostile action; under fire in peacetime activities; and in other tragedies, such as a fire at a military field site. It is hoped that this memorial will serve as an important reminder both of the crucial role that cryptology plays in keeping the United States secure and of the courage of these individuals to carry out their mission at such a dear price. The memorial is a black granite wall, 12 feet wide and eight feet high, centered with a triangle. The words THEY SERVED IN SILENCE, etched into the polished stone at the cap of the triangle, recognize that cryptologic service has always been a silent service -- secretive by its very nature. Below these words, the NSA seal and the names of the 152 military and civilian cryptologists who have given their lives in service to their country are carved into the granite. The names are at the base of the triangle because these cryptologists and their ideals -- dedication to mission, dedication to workmate, and dedication to country -- form the foundation for cryptologic service. The striking memorial was designed by an NSA employee. It is housed in the NSA Headquarters complex at Ft. Meade, MD.